In my younger days, I was pretty much a wanderlust. I guess that came from having a vivid imagination and a love for books. Books open your mind to different places that you won't otherwise get to visit. From fairy tale books with castles and forests, to various book genres. I think all books I ever read painted such beautiful settings that made me look forward to traveling, with the high hopes that at every place I will ever go to it will surely offer the same beautiful scenery and enjoyable experience. The thought of encountering a breathtaking meadow just around the bend, or a gurgling brook when I turn a corner, or a serene seascape -- those thoughts propel my love for traveling. And travel I did, here and there and everywhere. By land, sea, air. Taking a bus, walking, running. hiking, climbing -- travel! Travel plans definitely change with the onset of parenthood -- they disappear altogether. When you go through the phases of your children's childhood, the only travel you ever undertake is as far as your pediatrician, if you can help it. And later that extended to as far as the children's schools and the nearby parks and playgrounds. Safety. 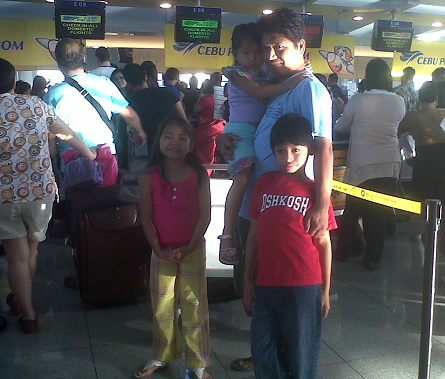 When we travel with children, their safety is foremost in our mind. Babies are such fragile beings at this stage. Toddlers are a handful and can be rambunctious during trips. While pre-teens and teens, though better-behaved, have a mind of their own and need to be looked after, too, for their safety. Any type of travel involves a certain degree of physical activities that may potentially cause injuries to children. One has to be careful with even the food they eat in a trip. In case of untoward accidents... I shudder to think of travel accidents and children at the same time! Ease. Having a child in your arms, or holding on to your hand, or fussing about something, or needing something, or crying, while walking up and down airplanes, cars or trains -- with luggage and all -- is not an easy feat. All the elements of travel, from transportation, to accommodations, and travel activities, become more complicated with children in tow. Details. Traveling with children is a major production because of the many details that one need to consider long before we even make the trip. We pack for all the kids, for example, and their travel packs won't include mere clothes, but there are milks, diapers, snacks, emergency items, toys, books, and the like that we also need to bring. Money. There are more financial considerations when traveling with children. The cost of transportation (for bus, train, plane or sea travel) alone increases with each child. The cost of food and accommodation also increase. Time. We need to make the trip as comfortable as possible for children. We may need to travel in easy stages, and make more stopovers, which will involve more time spent in traveling. 1. Plan carefully and well ahead of time. Determine the safest routes to travel and the mode of transportation. Will the children be comfortable in a train or with riding a plane to the destination? If the destination is optional and you just want to take them on a holiday or vacation, research online or pore through maps for the best child-friendly destinations. If the schedule is flexible, opt for the time when the weather is nice to travel. Bring everything necessary, anticipating the needs of each child before and during traveling to the destination, staying at the destination, and getting back home. Pack wisely, however, so as not to burden yourselves during the trip. Don't forget your travel documents, cash or credit cards. Bring a small first aid or emergency kit. 3. If traveling by car, keep it in fine shape before the trip. Always keep an eye on the children, especially in crowded areas, around stairways and elevators, where things maybe difficult to navigate for them. Keep the children as comfortable as possible. Any signs of tiredness, hunger, medical issues, anxiety or just plain restlessness have to be addressed as soon as possible to make for a pleasant trip. In getting to the destination and back home, maintain the same vigilance for the children's safety and protection. And finally, the best thing to do when you cannot avoid traveling with kids is to enjoy yourself. Treat the trip as an adventure that you are sharing with your children. A time for family bonding and quality togetherness. Of making memories. It's their first little steps toward exploring the world, and you are privileged to take those steps with them. Do your best to make each trip together a memorable and wonderful experience for them.